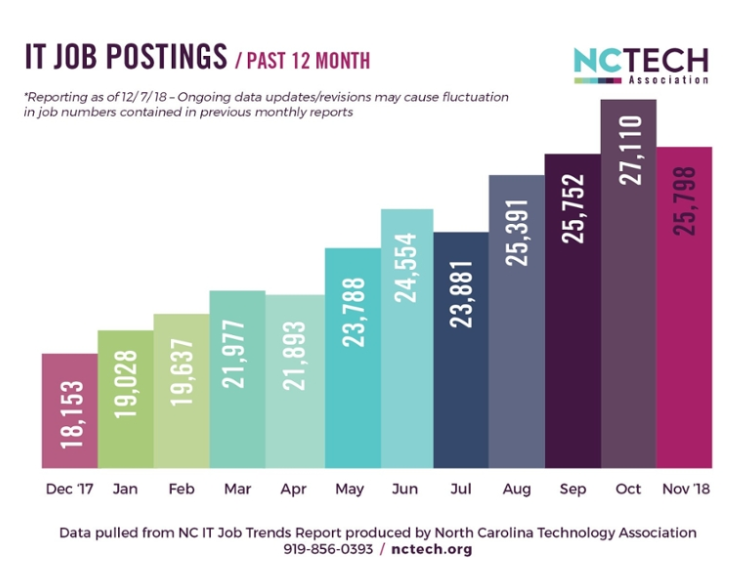 Greene Resources has continued our partnership with NC TECH to deliver the monthly IT Job Trends Report. This report provides a snapshot of the environment for tech employment in North Carolina. With data from Gartner, the world’s leading IT research and advisory firm, IT job postings are broken down into various top ten lists for the month. Follow yearly growth of tech positions based on categories such as skills desired, job title, employer, and region. A rolling 12-month chart reflects the trend in job openings over the previous year. “North Carolina outpaced the national trends, with the Triangle region topping the charts in growth among the state’s major metros,” said Brooks Raiford, President & CEO of NC TECH. This month, we take a deep-dive into Kubernetes. This rapidly growing skill is the most searched for keyword on Indeed.com. Learn more about how it relates to tech hiring and employment in our Supply and Demand Snapshot. Read the entire report here. 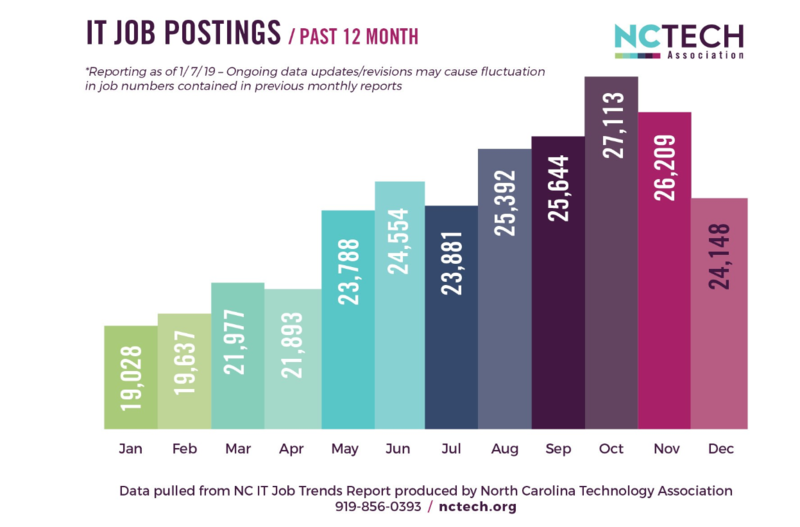 Greene Resources has continued our partnership with NC TECH to deliver the monthly IT Job Trends Report. This report provides a snapshot of the environment for tech employment in North Carolina. With data from Gartner, the world’s leading IT research and advisory firm, IT job postings are broken down into various top ten lists for the month. Follow yearly growth of tech positions based on categories such as skills desires, job title, employer, and region. A rolling 12-month chart reflects the trend in job openings over the previous year. 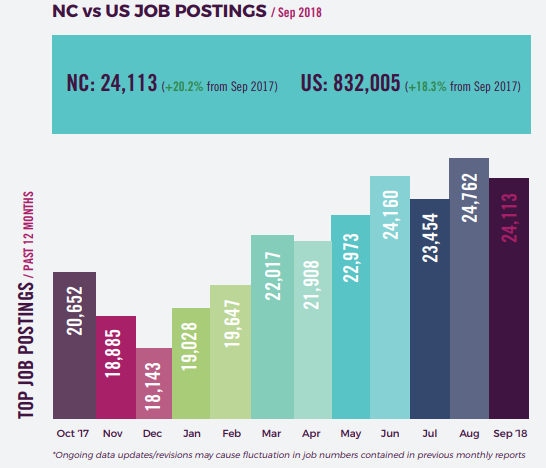 “As is typical, the fourth quarter saw a slow-down in hiring, but interestingly, the fourth quarter also had the highest average job openings of all quarters in 2018,” noted Brooks Raiford, President & CEO of NC TECH. As noted in the recent Economic Forecast, job growth is expected to continue into 2019. For those embarking on a job search this year, we cover the top 10 fastest growing skill sets that employers are looking for. Read the full report here. The Greater Raleigh Chamber of Commerce recently held their annual Economic Forecast which gave a review of the economic performance in 2018 and looked ahead to the priorities of 2019. Hosted by Gerald Owens, anchor at WRAL-TV, the Economic Forecast featured presentations from Thomas Barkin, President and CEO of the Federal Reserve Bank of Richmond, and Charlie Dougherty, VP and Economist at Wells Fargo. The two speakers then answered questions from the audience. Economic Growth: 2018 finished with a strong performance; GDP grew 3.3% and was coupled with low unemployment and an increased number of jobs. Growth will continue in 2019, though likely at a slower pace. While there are disparities between the growth of urban and rural areas, these gaps are closing. Growth Insights: Two critical aspects to sustaining long-term growth are the labor force and productivity. Labor force participation will need to increase through the involvement of previously low-participation groups, which can be assisted through workforce development initiatives, improved benefits, and increased flexibility with work location and hours. Productivity has been strong thanks to new technological advancements but has recently slowed due to a lack of business investment. As Barkin explained, much of this is attributed to fear of another recession. 2019 Priorities: Because he believes labor force participation and productivity are key, Barkin laid out a few priorities that are closely tied to these two metrics. He encouraged policies to help draw potential workers into the labor force, such as paid maternity leave to incentivize women, and early workforce development to encourage college graduation or alternative options. Legal immigration should be embraced, as it is closely tied to new technologies, startups, and increased consumer spending. Finally, businesses need a healthy environment in which to function that consists of clear rules and stability. Economic Growth: The growth outlook for 2019 remained consistent and is predicted to slow slightly from 2018. Last year’s strong GDP was driven by strong consumer spending and the fiscal stimulus that added to the GDP. That stimulus, however, is expected to fade in the coming year. Growth Insights: There are a number of global indications to the economic performance of this coming year. The sentiment of the manufacturing industry, which historically correlates well with GDP, is weakening from previous numbers but is still well above average. The same holds true for oil prices. Though they may be low, the US still has strong production of oil. The labor market remains very strong and consistent. It recently boasted 100 consecutive months of positive change and is a strong driver of consumer spending and growth. Raleigh and the Southeast: The Southeast is home to some of the fastest growing economies in the nation and North Carolina is no exception. The state is growing faster in hiring than the rest of the nation, across all industries. Hiring is expected to slow slightly in the Southeast region but will still be above the national average. Unemployment is already low but predicted to go even lower in North Carolina. This is expected to continue to push up wages. Thanks to strong tech and energy sectors, both Charlotte and Raleigh were among the top 15 fastest growing metro areas in the country. Both speakers shared an optimistic view of 2019 for North Carolina. Unemployment will continue to fall as almost 90,000 new jobs are added across industries. The state will continue to benefit from a growing population of job seekers drawn to the success of the region and competition for top talent will be fiercer than ever. If you are one of the many businesses growing your team this year, this presents an exciting opportunity, but also a lofty challenge. Let Greene Resources help you make the most of this opportunity and find the right person to make a lasting impact on your business in 2019 and beyond. Watch the complete Economic Forecast here. 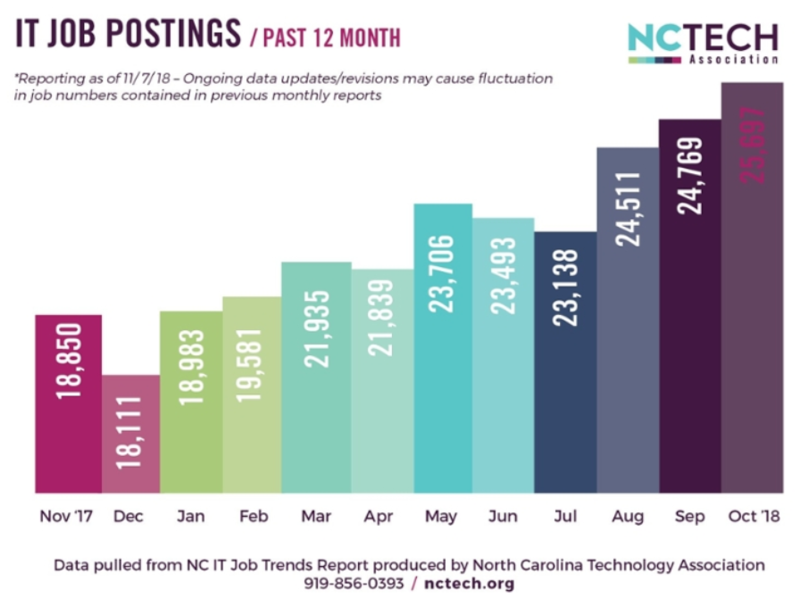 “Although a slight dip from the previous month, November had the second highest openings of the past twelve months, and were higher than November of last year,” said Brooks Raiford, President & CEO of NC TECH. This month, we take a closer look at Python, a skill consistently included in the Top 10 Skills list this year. Read the latest report to learn more about what the job market looks like for this technology. Is Recruitment Process Outsourcing for You? Since 2000, Recruitment Process Outsourcing (RPO) has steadily gained steam in the staffing world and is not predicted to slow down anytime soon. In this model, the RPO vendor becomes an extension of their clients recruiting department, handling everything from screening applications to interviewing to analyzing the performance of the entire process. As a result, the hiring process moves quicker and more efficiently. As more organizations adopt this model, it is easy to see the benefits. RPO models offer hiring managers both time and cost savings while increasing candidate engagement. The delivery can be easily scaled to meet fluctuating demand throughout the year. By analyzing and measuring key performance indicators, recruitment and hiring procedures are continuously refined. These improved processes ultimately lead to better outcomes for the organization. There are numerous reasons a company may decide to use Recruitment Process Outsourcing to fill their hiring demands. Below are some of the most common. You have specialized talent needs. Because an RPO model is highly customizable, it is ideal for roles that require a specialized skill set. Recruiters will develop unique sourcing methods to target candidates that may be hard to find. By building this network of qualified candidates, they are always poised to meet your hiring demands even for difficult-to-fill positions. RPO models are also ideal for high-volume positions. With a team of dedicated recruiters, your recruiting and hiring processes can be easily scaled to meet demand. Maybe your organization has hit a growth spurt and you need to staff a new sales region. Perhaps you are facing increased customer demand over the holidays. Whatever the reason, an RPO delivery may be the answer to your high-volume needs. You want to increase candidate (and employee) engagement. The candidate experience is more important than ever in attracting and keeping top talent. As such, a majority of RPO solutions are going beyond standard sourcing and hiring to increase engagement throughout the life of the candidate. Many RPO deliveries are incorporating best of class engagement software to ensure a consistent experience. This starts with prompt and regular communication with candidates, both before and after they apply. It continues through each step of the interview process. Engagement can even extend through the candidates first year of work once hired, including onboarding, internal moves, and exit interviews, if applicable. The result is decreased turnover, increased referrals, and higher quality hires for the organization. If you fall into one of the above categories, consider adopting an RPO solution for your recruiting and hiring needs. Greene Resources is a trusted RPO partner for many, offering full life cycle recruiting and project-based recruiting, among others. Contact us today to discuss your customized delivery! Job searching can be a challenge for anyone. For many veterans, searching for civilian employment is even more difficult. According to Prudential Financial Services, 69% of former service members say that finding a job outside of the military is a challenge. From creating a resume to explaining their experience to finding a good fit, the job market is full of obstacles for the men and women who serve our country. Luckily, countless resources exist to help make the process easier. Check out these tips to jump start your job search! You may have the perfect set of skills and experience for a position, but you can still be overlooked if the hiring manager cannot make the connection on your resume. Spell out any acronyms and change military titles and terminology to equivalent civilian terms that reflect your responsibilities. Start by entering your job title and duties into the Skills Translator on Military.com for guidance on how to explain your position in a way that is easy to understand. Skills and experience are important, but they are just one piece of the puzzle. The military also teaches valuable soft skills that can set you apart in the job search. Use networking events and interviews to showcase your communication skills, initiative, leadership abilities, and other traits that you developed during your service. Other veterans are a great resource to utilize as you conduct your search. Talk with them to understand what challenges you may face and how to overcome them. Once you get an idea of how your military skills will translate, identify roles and companies that might be a good fit for you. Research the organization to find other veterans currently working at the company who may be able to offer advice and/or make an introduction. Reach out those individuals and try to schedule “informational interviews.” This is a casual opportunity to learn about the company culture, the role responsibilities, and what the hiring authorities are looking for in their next hire. Even if the company isn’t currently hiring, building these relationships can lead to prospects in the future. As you network and set professional goals for yourself, you may notice a need for continuing education or training to reach those goals. If you need to learn a new skill, consider online classes through a local university. Numerous institutions offer online certification programs that expand upon skills you may already have. The federal government also offers education and training programs for veterans preparing to enter the workforce. If you are looking to start an impactful career as a civilian, contact Greene Resources and let us serve you. In any conversation surrounding workplace culture, it seems that the topic of diversity is almost inescapable as of late. Indeed, it has become a buzzword of sorts, inspiring countless articles, info graphics, policies, and discussions. Though diversity of gender, race, education, etc. may be top of mind, the term is now beginning to change shape to embrace a new concept: neurodiversity. The National Symposium on Neurodiversity at Syracuse University defines neurodiversity as a concept where neurological differences are to be recognized and respected as any other human variation. “Many individuals who embrace the concept of neurodiversity believe that people with differences do not need to be cured; they need help and accommodation instead,” explains John Elder Robison, a scholar in residence and a co-chair of the Neurodiversity Working Group at the College of William & Mary, in a blog on Psychology Today’s website. In the workplace, that translates to viewing neurological differences not as a hindrance, but as a competitive advantage that, when accommodated and supported, can help take your company to the next level. Neurodiversity programs are being implemented at pioneering companies across the country to tap into the potential of this previously untapped group. Though these progressive HR programs typically focus on people with autism, they can be easily expanded to include those with dyslexia, ADHD, or social anxiety disorders, among other conditions. These individuals may not fit the standard employee profile that hiring managers look for due to non-typical social skills. However, they often have extraordinary abilities in fields such as math, memory, or pattern recognition that can be extremely useful in careers in data analytics, software engineering, or cyber security, among others. Despite this, as many as 80% of the neurodiverse population is unemployed. Even those with advanced degrees struggle to find companies that are able to look past their disorder. Rigid processes and unchanging methodology are to blame. Companies want to use tried-and-true recruitment and hiring methods that can be easily scaled. While this is effective for hiring in large quantities, by design, it eliminates neurodiverse applicants. Those with neurological differences do best when set processes, such as interviewing or on-boarding, are adjusted to accommodate their unique needs. This may sound daunting but can frequently entail only small fixes with a large reward. For example, Hewlett Packard Enterprises (HPE) has extended their interview process to allow time for neurodiverse individuals’ skills to emerge naturally. Early results show that the neurodiverse teams at Australia’s Department of Human Services, placed by HPE, are 30% more productive than other “neurotypical” teams. In addition to increased productivity, organizations with neurodiverse individuals report experiencing more successful recruiting and hiring efforts, even in tough-to-fill skills categories. This becomes particularly important in the face of the growing skills shortages that tend to hit technology fields the hardest. According to the Korn Ferry Institute, technology, media, and telecommunications fields will be 1.1 million workers short by 2020. That number grows to 4.3 million by 2030. A neurodiverse workforce can help mitigate that impact. Other advantages include higher levels of employee engagement and morale, lower turnover rates, and of course, reputational benefits. Some big names are already enjoying these benefits, thanks to their neurodiversity programs. SAP has the longest running program; its Autism at Work program lunched in 2013. They customize a month-long hiring process to each neurodiverse candidate and focus on skills-based assessments. Microsoft’s Autism Hiring Program uses similar “interview” methods that focus on practical skills instead of social skills. JPMorgan Chase restructured its interview process and conducts specific training to help recruiters and hiring managers utilize alternative hiring and communication methods. Given the successes of these programs, it’s only a matter of time before they become common practice in companies of all industries. Get ahead of the curve by analyzing your own recruiting and hiring processes. Consider the following adjustments to make it more accessible to all. Common interview “tests”, such as handshakes and eye contact, are not usually a strength of candidates with autism and similar disorders. Judging their job abilities on this type of interaction automatically puts them at a disadvantage, even if they may very well be the best candidate for the job. Instead, consider the hard skills they need for the position and test those in a casual setting. For example, SAP has candidates build a LEGO robot from a set of detailed instructions. Exercises like this are more comfortable for the candidate to complete and offer insights as to how well they will perform the job at hand. While you are likely an expert in your business, you are probably not an expert in neurological disorders. A key part of the process is finding someone who is. Government or non-profit organizations devoted to helping those with unique needs can be a valuable resource in finding, screening, training, and mentoring talent. For example, HPE partners with Autism SA (South Australia) to fill the knowledge gaps in their program. Lean on your partners for help in everything from navigating employment legislation to supporting your employees’ lives outside of the office. As with any organizational shift, your leaders will need guidance. Work with your managers to teach them best practices for interacting with neurodiverse applicants. Help them, in turn, coach recruiters and others involved in hiring to communicate effectively. This means avoiding open-ended questions, implementing structure, and giving concise feedback. Greene Resources is partnering with NC TECH in 2018 to deliver a monthly report on IT Job Trends in North Carolina. This report provides a snapshot of the environment for tech employment in North Carolina using the TalentNeuron tool from Gartner, the world’s leading IT research and advisory firm. Readers can view the number of IT job postings presented in various top ten lists (skills, jobs, employers, regions) as well as a rolling 12-month chart reflecting the trend in job openings over the previous year. Job openings in September were up over 20% from this time last year. “Over the past twelve months, the most recent five [months] had the highest job openings, which suggests a durable trend,” noted Brooks Raiford, CEO of NC TECH. View the October report to learn more about September’s hiring data.